Camera mounts are both towards the back, rather than one towards the back and one towards the front. More visually balanced. They’re still basically centered though (one is on the near hole of the mounting bracket, one on the far hole, so they’re pretty much centered to within 1cm or so of each other). The cameras are Canon A480s I picked up a year ago, specifically because they were known to work with CHDK. They’re both powered from cheap knockoff (i.e. non-Canon-branded) 3.15v mains adapters. I was going to splice those into the shutter release switch, but to my intense annoyance that’s not enough voltage for a trigger, so I’ve got a separate 4.5v 1amp wall wart wired into a push button and thence to two USB cables. It’s a bit less elegant than it could have been, but seems to work fine so far. Total cost was something like AUD $300-400, with about half of that being the cameras. Note that if you’re in Australia, you probably won’t find keyboard drawer slides and column slides in large hardware stores (Bunnings/Mitre 10), so may instead have to visit a more specialist architectural fittings store for those pieces. I also couldn’t find wing bolts to mount the cameras, so substituted short 1/4″ bolts and packed them out with a nut each. (This was originally posted in the DIY Book Scanner forum – I’m reposting here for posterity). 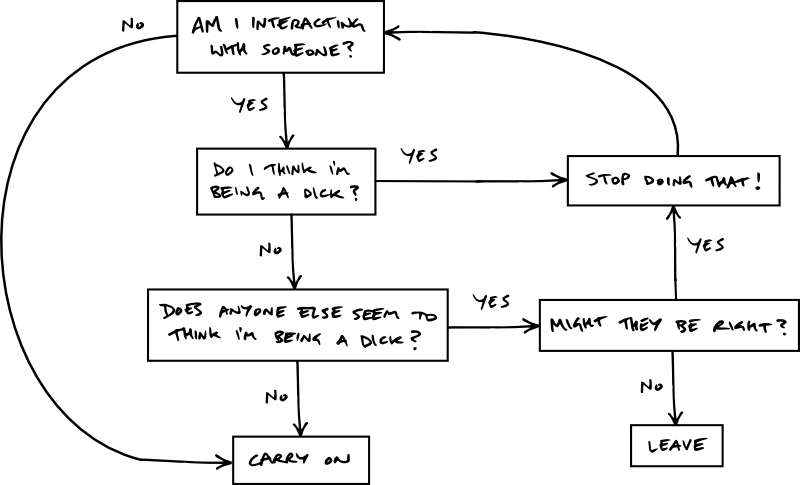 Apparently it’s not though, so if this flowchart isn’t sufficiently detailed, I’d suggest taking a look at some of John Scalzi’s notes. People, not commercial organizations or chains of command, are what make great civilizations work. Every civilization depends upon the quality of the individuals it produces. There was an article on news.com.au a few days ago alleging that “A FULLY operational pistol and assault rifle have been ‘printed’ from plans posted on the Internet.” Perhaps unsurprisingly, as you get closer to the source material, the reporting becomes steadily less sensational. The part printed was the lower receiver, which (long story short) doesn’t actually contain the explosion or the projectile. So the situation isn’t quite what you might be led to believe if you only latched onto the big chunky text in the first article, but it is an interesting development. It’s especially interesting in the USA, because (as I understand it) the lower receiver of an AR-15 is the heavily regulated bit – you can presumably buy all the other parts online, print the receiver yourself and have the dubious honour of being the owner of a mostly anonymous and somewhat riskier-than-usual firearm. It’s slightly less interesting for Australians because - as I pointed out elsewhere - under Australian law, you need the appropriate type of license to possess any firearm part. So 3D printing the lower receiver of an AR-15 assault rifle at home doesn’t really help the aspiring lunatic much. This is exacerbated by the fact that it’s currently almost impossible for any Australian to obtain a license for a functional semiautomatic rifle, or parts thereof. But, as was pointed out to me, the technology is only going to improve over time. One day there will actually be a functional, entirely 3D printed, homebrew firearm, and I assume someone will figure out how to 3D print ammunition too. That’s what I meant by “coming apocalypse” in the title of this post, and this is the point at which I expect some people to start screaming that 3D printers need to be banned, or at least made very difficult to access. Online file sharing gives power to music lovers, and takes it away from record companies. Done right, this results in a direct relationship between the music lover and the artist (the individuals), and the record company (the authority) either becomes irrelevant or seriously rethinks its business model. Mass near-instantaneous communication via the internet (blogs, twitter, etc.) and mobile phones takes power away from large centralised news providers, routes around censorship and gives individuals the ability to decide what sources of information to consider and what to ignore. That same communication tech affords the ability for people to organise in a hurry like never before (flashmobs, the occupy movement, the Arab spring). Everyone has a camera now. Police brutality is a lot harder to get away with, or at least a lot harder to hide. Organisations like GetUp and Avaaz now exist to give individuals a voice by running petitions, organising protests, funding advertising campaigns and lobbying governments. Social networks (whatever you may say about the sale of personal data to advertisers), are (at least overtly) about putting individuals in touch with the people they actually want to be in touch with. If they stop facilitating that, people will leave. All of these things are what you might call democratising technologies. 3D printing is too, but with one important difference – most of the above technologies, while they have a very real impact on humans, are essentially ephemeral. They’re mostly about shuffling data around. 3D printing actually causes new objects to physically manifest. Things that you ordinarily wouldn’t be able to make cheaply (or at all), or that would require a large investment in plant or equipment are, or soon will be, fairly easy to create. This goes way beyond providing the world with interconnects for lego (although that is admittedly very cool). Recently the first complete patient-specific lower jawbone replacement was built by a 3D printer. And if someone can make 3D printed food viable, that’s a big step on the road to a post-scarcity world. And that changes everything. That some people will create weapons with this technology is a risk, but I think this risk pales in comparison to the potential benefits to us all. I also think that in the future, people who print weapons with evil intent are going to be in the minority as much as people who use weapons with evil intent are now. How can we ensure this? By remembering that our existing laws cover violence regardless of how any weapon was manufactured. By recognising that when the balance of power rests with individuals, the most important thing we can do is try to build a loving, respectful, healthy society, populated with responsible individuals. By putting money into health and education, instead of giving in to fear and expanding surveillance of citizens under the guise of national security. By encouraging tolerance, respect and forgiveness. By teaching that if you desire rights like “life, liberty and security of person”, then it is your responsibility to respect that everyone else has each and every one of those rights too, and you do not have the right to violate them.